Day One: Whoa. So I had no idea how good I had it being vegetarian in the United States. People told me that living in Shanghai would be relatively easy, since after all it was one of the most international cities in mainland China. But if this night is any indication, it won’t be as easy as I thought. Tonight, after we checked into the hotel, my friend Zach and I wandered the brightly lit streets of Huaihai Road. Needless to say, we were hungry and overwhelmed. The two of us eyed window displays and food labels with confusion before settling finally on a bottle of Starbucks iced coffee from a Chinese 7–11. After that, we sat down in a booth in a bright, clean Chinese chain restaurant. 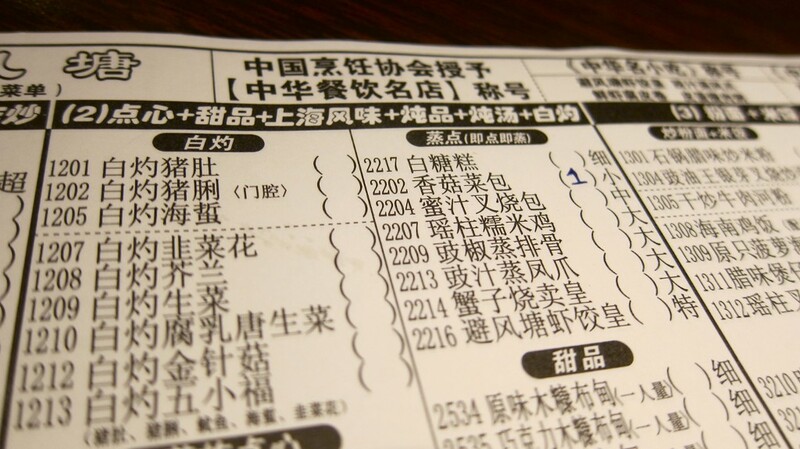 The menu was a checklist of all Chinese characters, with no pictures. I still have no idea how read Chinese, or even how to say the word “vegetarian,” but somehow I managed to pantomime my way to a dish of cold tofu and vegetables. I think it was vegetarian…but really I have no idea. Day Seven: While in hindsight I do think that dish was safe, I now get the sense that tofu isn’t necessarily a meat substitute in China. More than once I’ve ordered tofu dishes that come steaming out of the kitchen tucked in among broiling pieces of pork or beef. We’ve moved into our school now, and the surrounding streets near our dormitory are filled with small street vendors and shops. It’s no less overwhelming, because they’re all manned by abrupt, fast-speaking Chinese that have absolutely no time for your questions and meanwhile toss dumplings filled with ambiguous meats into boiling oil. 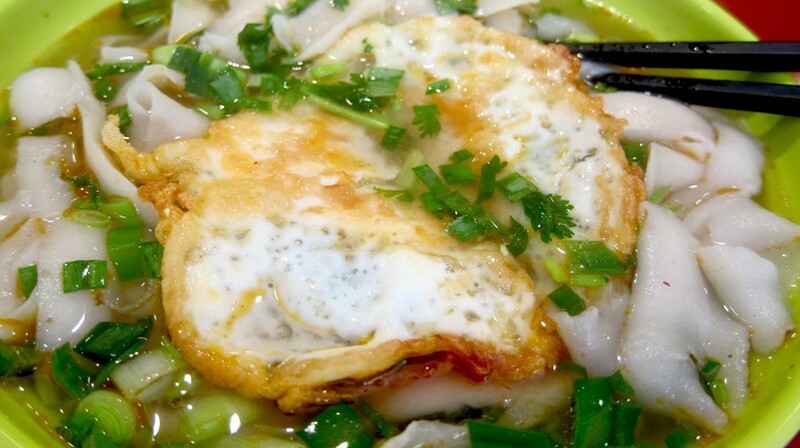 I still cannot speak any Chinese, and have no idea how to ask whether things have meat or fish in them. Because of this, I can’t eat by myself anymore. I end up following Chinese-speaking friends from place to place, standing tentatively on the side while they ask a question or two for me, then gulp down my food gratefully and pray there wasn’t some kind of misunderstanding. Day Fifteen: Still no command over the language yet, and even when I speak the locals can’t understand my shaky accent and tentative use of tones. Menus are nothing but Hanzi characters, unfamiliar slashes and strokes that swim in front of my eyes every time I tried to make sense of them. And even when there are pictures, or English of any kind, I still can’t tell whether there’s meat in them. More than anything, I can’t control what’s in my food, and that freaks me out. I’m finding myself increasingly afraid to eat. What’s really in this? Who knows. Day Thirty-Five: My friend Zach went to Beijing for the week and got the worst food poisoning in his life from what he thought was cooked seafood. He came back leaner and paler, and now is more than ready to return home. I guess I’m on my own from here on out. Day Fifty: Still alive, and admittedly better than ever. I have learned a lot in the last twenty days. I’m realizing our Chinese language classes are a bit impractical, teaching us words like “bike shed” and “office assistant” before we learn any words for food. So to remedy that I’m now grilling Chinese-speaking friends on how to say key phrases, such as “Does this have seafood?” “Does this have meat?” and the ever important, “Can you make this without meat?” I’ve learned to ignore the looks I get, because more questions are often better than less. Day Sixty: Interestingly, I’ve found it easier for the waiters in China to understand the full extent of my meaning when I said “I practice Buddhism,” rather than when I said the usual “I am vegetarian.” I assume this is because of China’s long-standing Buddhist history, because while China today is arguably more secular than ever, the faith still remains in the temples, which to this day are forbidden by religious law to serve any meat or fish whatsoever in its adjacentrestaurants. Speaking of the temples, I discovered that the restaurant adjacent to our nearest subway station, Jing’an Temple, is completely vegetarian, all vegetable broths, gluten meat and fake fish. Now this is what I’m talking about! 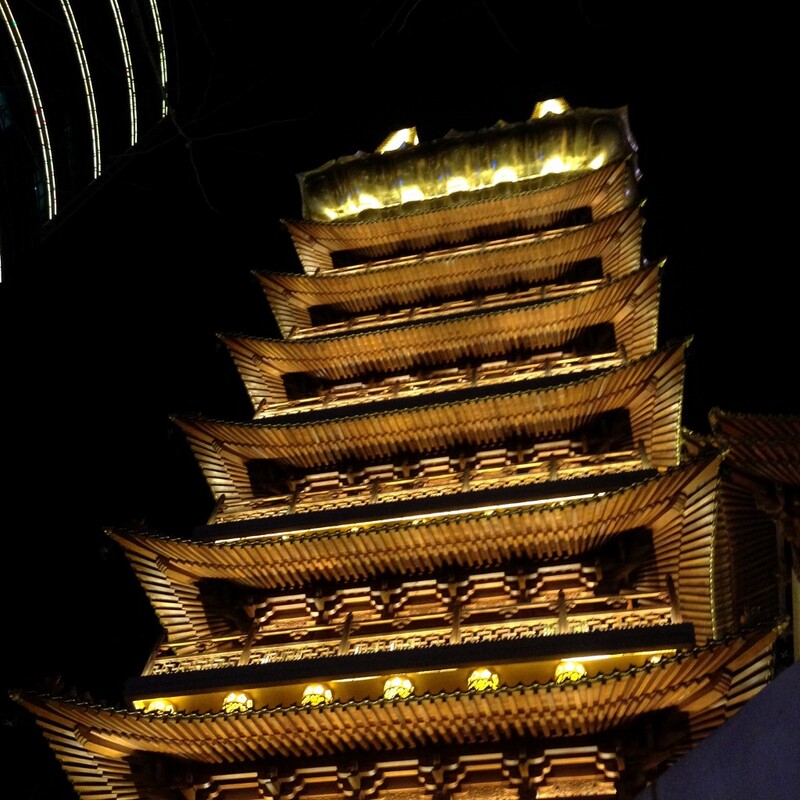 Jing’an Temple, home of one of the many Buddhist restaurants in Shanghai. Day Three Hundred Ninety: Over one year in, being vegetarian in China isn’t perfect. Last night I asked for tofu skewers, seared on outdoor grills by local Chinese, and bit into them only to find the distinct flavor of fish in my mouth. They assured me it was tofu, but I have no idea if they were telling the truth or not, or where the fish flavoring would even come from. Miscommunications still happen all the time, which leave me frustrated with both my Chinese ability and with the local culture. The reality is, I just have to accept that there is only so much I can do here. If there is a higher power or karmic retribution waiting to strike at me for breaking my diet restrictions in China, I hope it recognizes that I’m trying the best I can.